challenges and insights of managing parks and reserves in a regional city. Hosted in the Nottinghill Hall located just beside the City of Monash Depot. Lunch, morning and afternoon tea included. • How do you get your community engaged in Gardens and Reserve Management? • How do we cope with the extremes of weather? • What has happened to the Winter slow down? • How can we manage these changing conditions? • What are your key issues? 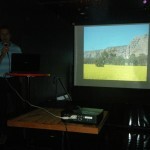 A successful night was held on 30 January for the Young IPWEA launch event at La Di Da in Melbourne. 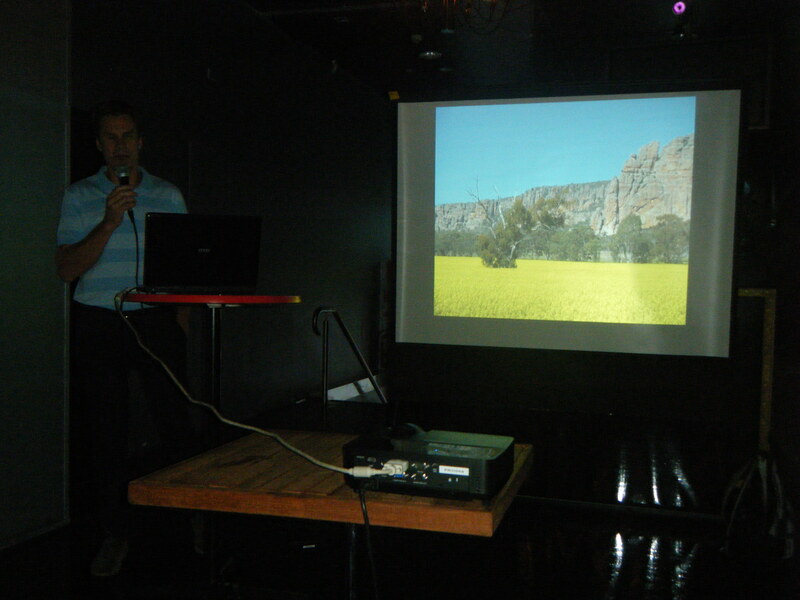 The event was sponsored by ARRB Group and received positive feedback from all who attended. 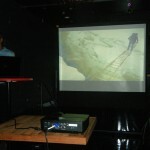 Steve Bell, an experienced mountaineer and adventurer was the guest speaker for the night. 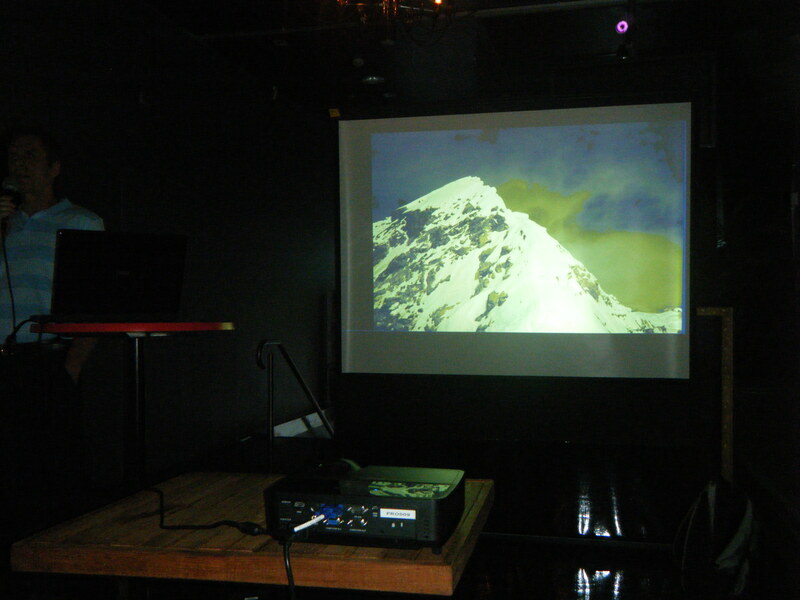 Steve provided a very interesting talk and had the audience captivated while he described stories of his mountaineering adventures. The group enjoyed finger food and a few drinks while Steve shared his experiences. Noted a picture of Mt Arapiles in Victoria and how much he wanted to climb this famous mountain as it was very well known in the rock climbing world. It was at this time that he had a large fall which resulted in a rethink. He sat back and thought “I’m human, I might be killed” where the fear of death had not previously crossed his mind. Quite a few friends had already been killed. Following this, the British Commandos (Marines) were looking for volunteers to go to Mount Everest, so he had a stint in the military for four years. Part of his military work involved setting up Camp 7 (last camp) on Everest, but he did not get the opportunity to reach the summit. He realised he’d had enough and it was time to get off the mountain when he spilled a fresh one litre bottle of urine (pee bottle) all over the inside of the tent which instantly froze. Following this work, and itching to get to the summit of Everest, he set up the first ever commercial expedition to the summit of Everest in 1993, and so started his company Jagged Globe. Steve noted that one of the Sherpa’s travelling with the group stayed overnight on top of Everest without oxygen on a previous trip, simply to say he was the first to do so. Sadly he died on another occasion when he went to do number twos during the night and fell down a crevasse. Once atop the south summit, there was a fantastic view of the northern summit ridge, the weather was fantastic. Steve noted that these days, there would be a large queue of people walking up the ridge. Steve also mentioned that more people die coming down the mountain than going up, an approximate death rate of one in ten people. 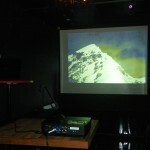 After Everest, Steve decided that it would be nice to climb the highest point on each continent. He started with Carstensz Pyramid (Puncak Jaya) in West Papua and claimed this as the Australia/Pacific’s highest point, as Australia’s Mt Kosciuszko is no real challenge. He followed this by returning to Antarctica to climb Mt Vinson, and completing the other continents, noting his favourite was North America – Mt McKinley in Alaska. 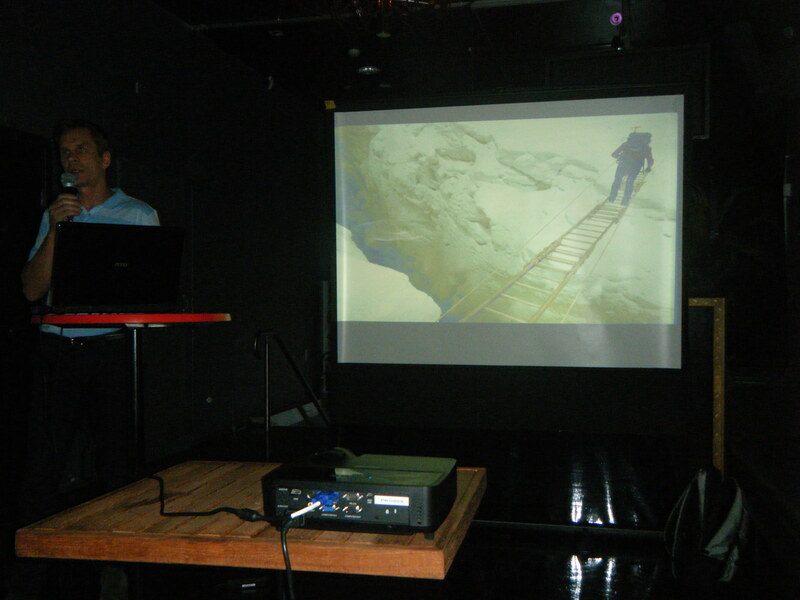 He noted there is often no view when climbing mountains, due to regular white-outs. Mountaineers don’t climb for the view, although it is a pleasant reward. Once accomplished, he had a reality check, thinking of his family and his three kids, and the enormous amount of friends and acquaintances who had died mountaineering. He decided to retire from mountaineering and spend time with his family. He emigrated to Australia for a change and lived in Melbourne before moving to Natimuk in Western Victoria, just up the road from Mount Arapiles. He noted he finally got to climb Mount Arapiles, and regularly visited to continue his rock climbing passion. He thought he must have something else to give to the small town. He heard that a local identity had been stirring the town up for some years with vague suggestions of opening a café, so Steve decided to go into partnership with him and make it happen. He successfully opened the café and ran it for a number of years before selling it. It is still a landmark in Natimuk today. He completed a stint working with Bear Grylls on his Man Vs Wild show and had to sign a confidentiality agreement. He participated in a fictional climbing documentary – climbing Mt Olympus on Mars, the fictional highest mountain in the solar system. He then returned to Melbourne, to work on a new project, where he is director of Snowflex, a year round ski field which he is bringing to Melbourne. IPWEAvic members are invited to attend the next ITSA (Intelligent Transport Systems Australia) Business event on a complimentary basis. A number of international guest speakers will be present giving an update developments in transport technology from around the globe. IPWEAvic in conjunction with Biosis has developed an IPWEAvic Information Series Event: Native Vegetation Regulation Reforms – how to operate under the new controls to be held at Manningham Function Centre Thursday 13th March 2014 9am till 1pm including a light luncheon generously provided by Biosis. How Do We Operate Under the New Legislation and Guidelines? • How changes to the state governments Native Vegetation Framework vegetation controls are likely to impact on the delivery of civil infrastructure projects. • Vegetation offsets – the new systems has a strong focus on this. How and where to purchase offsets. This is a free event but you must register to attend. Register here to attend this IPWEAvic Seminar. Asset Management in Parks Seminar was held on 27th November 2013 at Manningham Function Centre and sponsored by Yardstick and Citywide. It was a terrific conversation with much networking and exchange of ideas between the 70+ participants. Thanks goes to the seminar organiser MECC Consulting Pty Ltd and the MC for the event, Claude Cullino. 2. Consult, listen, and take the stakeholders with you. Many could identify with the formula relating to Performance = Potential – Interference. The End of Year Leadership Luncheon will be held on Friday 6th December 12noon till 2pm at The Green Acres Golf Club 51 Elm Grove Kew East. Our guest speaker is Rosanne Kava. Rosanne is going to share some of her thoughts on how engineers can show better leadership within their communities and give an insight into the challenges and experiences she faced in leadership of a rural municipality..
•Why is Asset Management policy formulation important? •What is the STEP Program? •How has Brimbank dealt with the new park assets in relation to the Asset register and renewal process?